Ever since I knit my first cardigan, I have disliked sewing up seams and have never really been happy with the results. I think part of the problem is that I am so impatient to finish, I tend to rush the seams. When I learned about seamless knitting, I knit a few seamless cardigans with better results. When I learned to crochet, I was surprised to find few seamless patterns. Crocheted seams tend to be rather bulky and crochet lends itself well to seamless and modular designs. I recently started a Seamless Crochet group on Ravelry. I was initially a bit worried that nobody would join, but so far we have 20+ members. On the subject of seamless crochet, I have just bought Everyday Crochet by Doris Chan (seen here with the Winter Issue of Interweave knits). 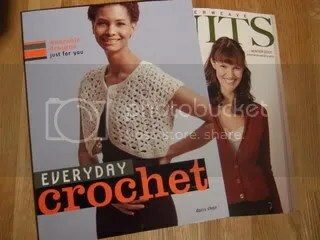 This is probably my favourite crochet pattern book so far. There are several top-down seamless garments (tank tops, long sleeved tops, cardigans, jackets) with a number of size and design options, as well as some nice crocheted belt patterns. I often end up selling my pattern books once I have browsed through them, but this is definately one to keep. I HATE sewing up my knitting projects. So much so, in fact, that I usually don’t do it and just cast on the next project, leaving the previous project to languish — knitted but not sewn up — in a bag in the cupboard. Please please tell me, what is seamless knitting? Seamless knitting is just knitting a garment in one peice, either from the top down, where you knit a yoke and then divide for body and sleeves, or from the bottom up where you knit the body and sleeves in the round, then attach them to form a yoke and then decrease to the neckline. that is a very pretty little t pattern. And, the white yarn knitting further on up reminds me of some that I used a long time ago. It’s a very nice slub type of yarn. Welcome to knit blogging, by the way.